1. We, members and representatives of major groups in China and Europe, have decided to join together in order to contribute to the success of the 2015 UN Conference on Climate Change (COP21) in Paris. We call for a fresh China-Europe dialogue in order to enter a new era in the fight against climate change. 2. Given the urgency of the climate change situation, we call on our governments and the international community to seal an ambitious, legally binding, global agreement capable of limiting the rise in temperatures to below 2℃ compared with pre-industrial times. The urgent recommendations of the Intergovernmental Panel on Climate Change (IPCC) can no longer be ignored. 3. In order to better tackle the climate crisis we must address the root of the problem: our global development model. It is necessary to rethink this model and to transform it, and to initiate on a global scale a transition to a sustainable society. 4. We call on Chinese and Europeans to accept their historical differences in their respective development paths. We need to shed light on what separates us in terms of development concepts and socio-economic constraints. This is the only way to overcome the current impasse on responsibility for climate change. 5. We wish to act as responsible partners in order to build together beyond the debates and differences. Our two continents must seize the occasion of the COP21 to propose to the world a new way of collective transition likely to gain the support of a large number of countries. No one can give lessons: it is together that we must design the future. Facing a global style of governance still centred on state actors, a new mode of governance seems necessary to identify the environmental challenges on a global scale. This new governance requires the dialogue between civilian societies and media to be taken into account during international negotiations. Governments, NGOs, companies, local and regional authorities and media should strengthen their interactions, in particular by using all the tools of participative dialogue and integration of the whole range of stakeholders. In global environmental governance, China, as a major emerging country, must endeavour to promote civilian society participation to ensure that its voice is listened to equally both nationally and internationally. Europe must acknowledge the necessity of a future built within a sustainable development approach, especially in negotiation of international commercial and strategic agreements. We call for a new legally binding global agreement, taking into account financing, technology transfer and transparency in the programmes of action on climate change. Moreover we desire the establishment of a global carbon tax and the creation of an independent global organisation composed of recognised scientific experts for the fight against climate change. We ask that developed countries address and respect their commitment to reduce more greenhouse gas emissions compared with their promises in the second period of the Kyoto Protocol. We also ask them to propose and respect ambitious objectives in terms of energy efficiency and the development of renewable energy. We also ask emerging and developing countries to engage more actively in the fight against climate change and to clarify their own commitments to reduce GHG emissions. We hope to achieve the long-term goal of an economy 100% based on renewable energy and energy efficiency, and governed by the sobriety principle (in terms of energy and matter). We ask for cities, local authorities and regional authorities to be recognised for their role in the transition to a sustainable model of life and sustainable society. City networks are essential to strengthening international dialogue and to addressing common challenges. We call for a law and a climate and environment justice system to be developed internationally as well as pilot initiatives to be developed regionally (or specifically regarding oceans) in order to protect people around the world who suffer from environmental and climate damage, and to affirm more clearly the responsibilities that are incumbent on each stakeholder. We call on Chinese and European citizens to mobilise in order to reduce their energy consumption and individual carbon footprints in professional and domestic life, and to actively ensure the measures taken by governments in order to establish a low-carbon, sustainable society. We call for the development of a statement of citizen responsibility for the world as based on international law. This new principle is intended to punish international personalities and leaders whose actions have a negative impact on the planet. We call for each family to engage in a low-carbon lifestyle to the extent of its means. We, the social actors in China and Europe, must strengthen outreach in this area so that people adopt an environmentally friendly lifestyle. We call on the youth of China and Europe to mobilise in order to become active players in global governance. At the same time we call on China and the European countries to involve youth in the formulation of policies on climate change. We, Chinese and European companies, request that governments improve environmental governance and set up a coordination mechanism involving the participation of businesses, NGOs and all actors in society. We ask that governments put in place legal and financial frameworks in order to encourage companies to mobilise for a low-carbon sustainable society. The public-private partnership should be strengthened in the draft of intelligent communities and smart cities. We call for the strengthening of cooperation between Chinese and European entrepreneurs in projects which fight against climate change. We commit to investing more in reducing consumption, and in technology and low carbon innovations that lead to job creation and sustainable solutions. We commit to adopting for our business a development strategy with the long-term focus of reducing energy consumption and the carbon footprint. We commit to participating actively in national and international objectives aimed at reducing GHG emissions throughout our activity, especially through a significant increase in energy efficiency. We commit to establishing a quantitative and binding goal of reducing greenhouse gases as part of a path aiming at a two-degree reduction of global warming by 2100. We wish to be actively involved in all programmes relating to the mitigation and adaptation of climate change and in the implementation of CSR policies. We agree to take responsibility vis-à-vis civilian society for sustainable economic growth relying on environmental protection and social progress. We need to strengthen the dialogue between Europe, China and other emerging countries by realising our potential synergies and proposing and addressing together all the answers to climate change. We are looking for mutual inspiration in terms of urban planning and making a transition towards sustainable cities. We need to create platforms for dialogue on renewable energy in order to establish common objectives for the development of a circular economy. We, Chinese and European NGOs, call for the strengthening of Sino-European cooperation in the areas of finance, technology transfer and action capacity in order to mitigate and adapt to climate change. We must mobilise by designing campaigns to sensitise society to knowledge and green living. NGOs help to establish a platform for dialogue between China and Europe and to find areas of cooperation. These will play a bridging role between the two societies in order to clarify the differences of the two continents in their climate strategies. and hope there will be significant political progress towards the signing of a comprehensive and ambitious agreement at the Paris COP21 occasion in 2015. We ask that the climate emergency falls within the Goals for Sustainable Development programme for post-2015. We are participating in the Paris Conference in 2015 in order to adopt a new legally binding agreement for the period beyond 2020. Governments, in coordination with civilian society (NGOs, local and regional authorities, European and Chinese entrepreneurs), find ways to deal together with climate disruption and to initiate cooperative projects. The issue of international exchanges and their consequences on climate change, and the ecological crisis in general, will have to be raised and regulation solutions be proposed in order to establish the rule of the environmental best-bidder and to fight against socio-environmental dumping. For the Chinese, in addition to the Sino-French cooperation on nuclear power, it seems necessary to work together with Europe to build a global carbon market and to spread widely the production of clean and renewable energies. Inviting the other countries to integrate an international platform of dialogue impelled by the cooperation between Europe and China for a common fight against climate change. Negotiations for the fight against climate change have fallen into a stalemate since the Copenhagen summit in 2009, which did not even reach a political consensus among participating countries. This failure cannot be explained by the dominance of the traditional powerful countries or the conflict between north-south countries. The opposition of many interests fragmented various negotiating groups and resulted in the failure of the Copenhagen conference. Today, faced with the complexity of international negotiations, an intergovernmental agreement is not sufficient to address the global climate challenge. Therefore actors and non-governmental participants must also commit to carrying out daily activities at a local and national level in order to enable an effective global response. In 1992 participants in the "Convention United Nations Framework on Climate Change" agreed on the principle of common but differentiated responsibilities as well as the implementation of sustainable development. In 1997 the Kyoto Protocol set targets of emissions reductions for developed countries without including developing countries. Over the last 20 years China has committed to the principles introduced in these two stages of the climate negotiations. The obvious difference in technological, economic and social development between Europe and China has had an influence on their positions in international climate negotiations. Europe has always played a leading role in the fight against climate change. The two continents, however, have the same goals for reducing emissions of greenhouse gases and the fight against global warming. The Chinese, like the Europeans, share a vision for concerted action on climate change within the international community. In 2015 the United Nations Framework on Climate Change Convention in Paris will be a critical opportunity for establishing a global consensus and adopting a legally binding agreement. Through its instigation of the first industrial revolution Europe has reached a very advanced stage of development. As this industrial and economic development progressed throughout the second half of the 20th century, it has made serious destructive impacts on the environment. China has undergone its own rapid development in the last 35 years. In the eyes of many Chinese the responsibility for climate change thus amounts historically to developed countries, which recognized their historical responsibility from 1992. Developed countries, including Europe, acknowledge that environmental issues have emerged only in the 1970s, and it took 20 years to form a common cause. Therefore some countries, and especially countries from the European Union, have taken the lead in reducing emissions of greenhouse gases through the Kyoto Protocol. In China, at a time when development is reaching a stage at which carbon emissions are increasing exponentially, it is both timely and necessary to make a technological leap. This requires organisational innovations and changes in behaviour so as to create a low-carbon competitive economy. In order to do so, the Chinese seek financial and technological support, strengthened from Europe and developed countries. In addressing climate change, and particularly financing climate action, governments are passing around the responsibilities of adaptation and mitigation like a "hot potato." Now many social actors in Europe believe that all countries should consider the stability of climate and natural resources in general as a common good. This "community property" must take precedence over the rules of competition in today’s dominant economy. The responsibility of an actor should be proportionate to its equity, power or expertise. In this context the objectives of sustainable development are used to identify actions at a global level for the proper management of this common good and respect of objectives fairly established and respected. We have identified 12 themes to develop through thematic workshops, the strategies of common response by Chinese and Europeans. 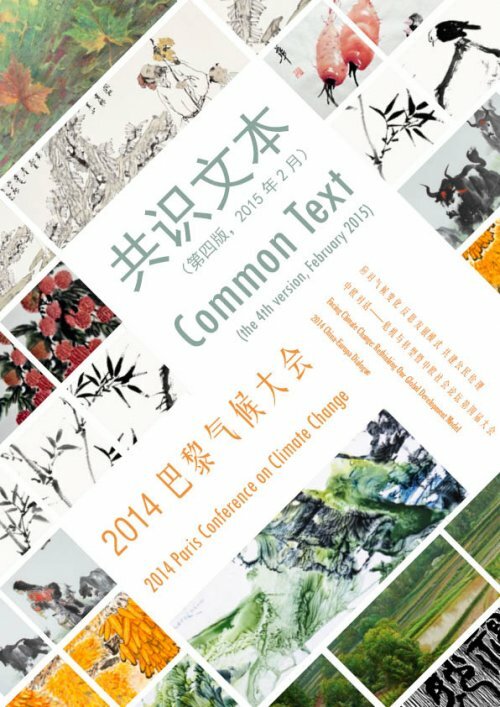 The workshops, which will amend and enrich this Common Text, are the body of the conference organised by the China-Europe Forum from December 2 to 5, 2014, in Paris, Geneva, Brussels, Lyons and other cities. In both developed and developing countries there is an urgent need to bring the cities into a transition towards a more sustainable model. Europe has taken the lead in this field and gained much experience, through such initiatives as eco-cities and eco-quarters in England, Sweden and Germany. China has started pilot programmes, but to ensure their success it is necessary to strengthen the platform for dialogue and the sharing of experience on sustainable solutions. Europe and China should encourage local capacity building in the respective communities using existing technology. Implementing and adapting these technologies to local circumstances is of fundamental importance. In order to accelerate local capacity building, the government should tie civilian society and the private sector into project development by using financial risk insurance, thereby leveraging the effect of public expenditure. Social cohesion is key to resilience, and this relies on people-centered urban spaces. We should leverage the force of the market. Globalisation concept: how can we adapt global technology to local capacity? And how can we involve all the various stakeholders? How can we create multi-modal spaces and multi-functional houses? We have to take into account all stakeholders while bearing in mind that there will be a gap between the levels of entry of each of them. We should accept and respect this difference. Housing and its role in urban renewal is at the heart of energy transition. In Europe, and particularly in France, social agencies work on energy savings by renovating parts of urban heritage and building energy efficient houses. We must move further and work on buildings that produce energy in neighbourhoods while rethinking urban mobility in order to deepen the energy transition and enhance the fight against climate change. We must strengthen the sharing of experiences between Chinese and Europeans. The issue of social ties is essential. The role of aging in the development of housing and urban renewal is important in China and Europe. The common challenge is to enable people to live as long as possible in their neighbourhoods and in their homes. In European countries, the problem is treated by grouping the elderly in small communities in dedicated housing. In China it is mostly the family that supports the elderly, which is not the case in France and Europe. The circular economy is a space for joint reflection for the Chinese and Europeans. The strategic intent is to contribute to initiating a drastic shift to re-adapt our activities to environmental basics. This includes transverse and systematic thinking, and acting and development of remedial / positive impact projects. This approach offers tremendous opportunities for creativity, improved wellbeing and co-operation. Build local multi-partner organisations for facilitating local adoption of the circular economy. Carbon Management: A low-carbon society is created when each of us follows a simple mode of life dedicated to low carbon and sustainable consumption. This means that individuals and companies as well as public authorities follow a low-carbon strategy (transport, energy, etc.). Better use of energy and technological progress are at the heart of our capacity to tackle climate change. Both the Chinese and European delegations are considering the same range of low-carbon technologies. Implementation, however, would need to reflect different energy mixes and economic structures, industrial GHG emissions abatement technologies and different roles for institutions. We recognise the different backgrounds and institutional environments between China and Europe. Europe should better address concerns on the competitiveness risks of carbon constraints. China should encourage more stable and liberalised institutions. We are facing different situations in China and Europe as regards energy. In China there is rapid industrialisation which leads not only to high GHG emissions but also to local pollution. The European Union is also addressing emissions from energy production. We share a common challenge of energy security, which requires diversifying our energy sources, in particular renewable energies. We agree about the existence of opportunities for exchange on capacity building concerning management of GHG emissions reduction technologies and processes. We emphasise the importance of providing a long-term view to guide the actions of firms and societies. In addition we support increased involvement from local authorities to help them be more informed of the risks posed by climate change and possible actions at local levels. The Chinese approach to corporate social responsibility is mainly dedicated to environmental issues. The European approach is primarily based on the concept of sustainable development as three pillars: environmental, social and economic. Providing SMEs with the human, financial and technological support to participate in the collective transition to a sustainable and responsible economy. Unsustainable consumption and production patterns are the primary cause of environmental degradation, including climate change. Sustainable Consumption and Production (SCP) provides life cycle based solutions to achieve the transition from unsustainable to sustainable patterns of consumption and production. Europe’s and China’s economy are closely connected through global value chains and solutions to realising SCP must be sought together. Due to the different stages of development of China and Europe, SCP solutions must be adapted to the different conditions on the two continents. An important area for cooperation of Europe and China on SCP is green supply chain management. In Europe, cleaner production and environmental management in companies has been implemented in most countries. Therefore the main focus now lies on reducing environmental and social impacts resulting from unsustainable consumption patterns in the areas of food, housing and mobility. This not only entails greening of products in the market, but also the reduction of excessive consumption to safe levels and creating lifestyles within the carrying capacity of the planet. In China, it is first considered that mankind should not engage in excessive and unsustainable consumption compared to the actual level of development and current production. China, like many developing countries, is concerned with first producing sufficient goods in order to reduce poverty and meet all the needs of their people, and dealing with other considerations later. China is facing the double challenge of implementing cleaner production practices and environmental management in many industry sectors, while at the same time the impacts from consumption of the emerging urban consumer class are becoming obvious. Enabling consumers to make sustainable purchase choices with reliable product information and labelling. Awareness of the low-carbon necessity is fundamental to transforming a mode of irrational economic development into sustainable development. Awareness through the dissemination of information and knowledge is also essential. Although Chinese and European companies do not share the same level of awareness on climate change due to differences in historic trajectories and living standards, they have a vision and common goals as regards strengthening decision consciousness. Educating on and communicating the issues of climate change requires opinion surveys, studies, and programmes in schools, administration and business. These should enrich schemes, beginning in schools with the principles of responsible behaviour. Activities enabling citizens to experience low-carbon lifestyles should also be organised. Symbolic joint large-scale actions should be organised on both sides of the planet. To achieve change in the development model, youth employment must be at the heart of energy transition in Europe and China. What is the place of young people? What is their role in companies in the energy transition sector? What strategies for career training are related to sustainable development? How should young people be integrated in the green economy and how should it be made a sustainable source of job creation? We must cooperate on joint methods of consultation with citizens on urban development projects. In Europe more than in China, consultations are very systematic and are more structured in the form of "co-production" of urban projects with the citizens. Youth is often at the forefront of civic action. It also represents the future of the fight against climate change. We must therefore consider how to encourage youth to participate. First, there are the public authorities which can encourage traditional media and social networks to increase output tailored to youth in order to achieve an "environmental ethic". In order to transform young actors, the media could also offer a participatory experience as “climate journalists", enabling them to observe, undertake field investigations and contribute to the climate debate. Furthermore, it is important to involve young people in decision-making, as illustrated by the Delegates of the United Nations Youth programme. Organising via universities calls for student projects on the environment as a competition with public funding for winners. Climate change calls for the creation of a universal right capable of producing obligations to all (erga omnes). Recognising the climate through providing a special status in international law is urgent but is not considered a legal objective. Today’s rules are intended to ensure free trade and investment protection and are weighted against fundamental values, including the environment. Constitutionalising of the limitation to two degrees, the maximum amount of CO2 emissions for the rest of the century. How should energy transition be financed as a key strategy in reducing and adapting to climate change? How should private capital be attracted and public capital be better utilised? What would the modalities of implementation of "unconventional" policy be in order to refinance credits for low-carbon investments? The starting point for reflection is the search for more effective funding mechanisms on a larger scale. The debate can also be focused on the search for new mechanisms in line with the technological revolution of the Internet. A number of platforms of participatory financing (crowd funding) online have been used to finance projects in the energy sector. Set up a Green Investment Bank as one of the environmental investment instruments to achieve genuine green economy. Water is the first medium through which climate change worsens its impact on mankind and the environment. Water is not a “sector” issue but a resource at the very meeting point of all aspects of human development –including health, nutrition and energy security, environmental protection and reduction of the risks of natural disasters. Water is a fundamental component of all the “eco-systemic services” offered by biodiversity. Good management of sustainable water resources is crucial to the success of strategies aiming at the attenuation of and adaptation to climate change. China and Europe should promote the development of new technologies that can effectively address the challenges of water resources management, including the water implications for energy. It should be acknowledged, however, that while technology can be part of the solution it cannot resolve all of our problems. A change in values is also necessary.